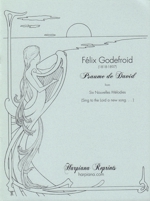 Psaume de David (Sing to the Lord a new song…) combines the majesty of a grand hymn with quiet devotional expression. 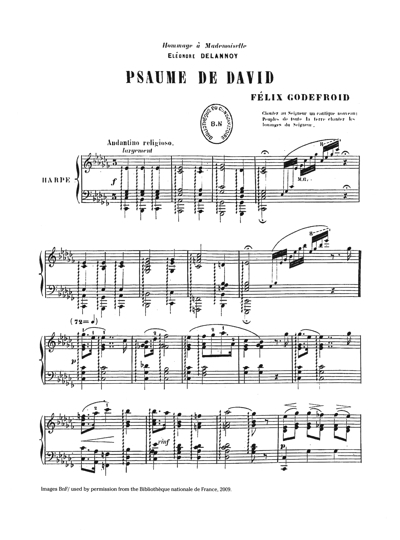 Set in the key of Cb major, the Psalm brings out the ringing quality of the harp, with wide rolled chords dominating a texture that also features arpeggios and running figures. For the right interpretation, it is important to go back in time to the second half of the19th century, in France, and be aware of a religious atmosphere steeped in pure sentiment. Think of Cesar Franck, another Belgian from the same generation, also settled in Paris, and his famous Panis angelicus. Or, for the purpose of intention, think of the fervent piety that culminated in the life of Saint Theresa of Lisieux.